The mayor and chief of police in Minneapolis are asking for the public's help in finding out how a 10-year-old boy was maced during Wednesday night's solidarity march protesting the death of Tony Robinson. At a press conference on Thursday, Police Chief Janee Harteau appealed on the marchers and motorists who were at the scene to come forward with testimonies and any video they might have of the incident. “We must have a full set of facts,” Harteau told reporters. 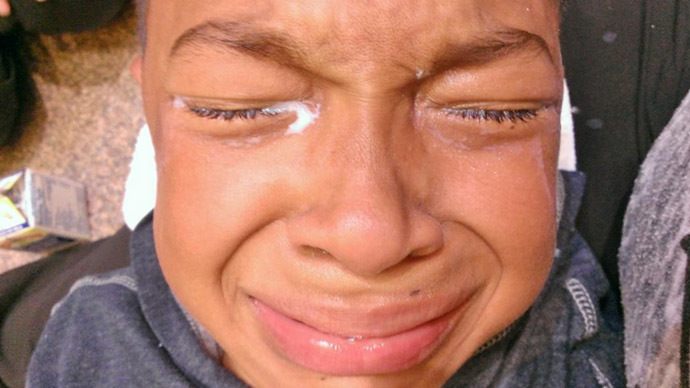 The police are investigating claims, backed by videos and social media posts, that a 10-year-old boy was among the marchers pepper-sprayed by police on Hennepin Avenue in downtown Minneapolis. In their brief statements, Chief Harteau and Minneapolis mayor Betsy Hodges underscored that Minneapolis had a history of peaceful demonstrations and urged any future marchers to stay true to that tradition. “I understand and appreciate people's concerns and will gather the full set of facts as quickly as possible. I assure everyone this will be a thorough investigation,” Harteau said in a statement on the Minneapolis PD Facebook page. The Minneapolis Star-Tribune reported that between 50 and 100 people assembled on Wednesday evening before the Hennepin County Government Center, protesting the decision of authorities in Madison, Wisconsin not to charge a police officer in the fatal shooting of 19-year-old Tony Robinson in March. The solidarity march was organized by the local group Black Liberation Project, member Vanessa Taylor told the Star-Tribune. Videos posted on social media show Minneapolis police using pepper-spray on some of the protesters. Caught in the blast was a 10-year-old identified as Taye. “There were no warnings. No options. No aid offered. No other direction. Nothing,” Taye’s mother, Susan Montgomery, told Star-Tribune columnist Nekima Levy-Pounds. “My son comes out to many actions. Some big, some small and everything in between. To see him marching to the beat of the drum with his people, chanting and engaging in peaceful protest to get the message about his life and other black lives matter out just to get sprayed by chemicals was truly heartbreaking,“ Montgomery added. Protesters claim Robinson's death is part of a pattern of police brutality against African-American men, pointing to a series of deaths such as Freddie Gray in Baltimore, Tamir Rice in Cleveland and Walter Scott in Charleston, among others. Large-scale protests began last year, following the police shooting of Michael Brown in Ferguson, Missouri. Levy-Pounds says Minneapolis, though it prides itself on being “progressive and much more liberal” than much of the US, is not very different than Ferguson. Citing the USA Today study of arrest rates, compiled from FBI data in 2014, she points out that the 2011-12 the black arrest rate in Minneapolis was 480.3 per 1,000 residents; while the non-black rate of arrest was 73.8. “We are already Ferguson. We just don’t know it yet,” Levy-Pounds wrote.